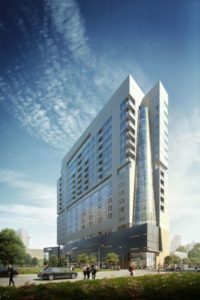 DC Partners selected Jordan Foster Construction as the general contractor for the Thompson San Antonio Hotel and The Arts Residences, a $116 million, 20-level mixed-use hotel-condominium tower on the San Antonio River Walk. In addition, the developer announced the opening of The Arts Residences Sales Center in the historic Tobin Center for the Performing Arts Administration Building, 115 Auditorium Circle, San Antonio. The project marks DC Partners’ debut on the San Antonio market. In partnership with Universal Service Group, the development is anticipated to create approximately 1,300 jobs and is slated to break ground this summer. The 337,000-square foot mixed-use development will replace the parking lot at the intersection of North St. Mary’s Street and Lexington Avenue, across the river from the Tobin Center for the Performing Arts and next to Hotel Indigo. The project will include The Arts Residences—66 luxury condominiums atop the city’s first Thompson Hotel and is slated for completion in 2019. Thompson Hotels is a member of the Two Roads Hospitality portfolio and features a collection of boutique hotels and resorts in locations such as Manhattan, Chicago, Nashville, Seattle, Playa del Carmen and Los Cabos. The project’s architect is Powers Brown, while the interior designer is Amass & G. The Arts Residences at the Thompson Hotel is exclusively marketed by Kuper Sotheby’s International Realty. The for-sale residences are priced from the $400s to over $4.5 million for penthouses. The 3,800-square-foot sales gallery located in the Tobin Center for Performing Arts Administration Building awaits prospective buyers with a fully appointed kitchen and model bathrooms. In addition, visitors may view a 3D animation video and the 3D architectural model of the landmark project. A selection room features all available finishes for flooring, countertops and backsplashes. “With 1.5 million people projected to move to Bexar County over the next 20 years, this project adds an upper-income housing niche to the downtown market that will be attractive to business people,” Bexar County Commissioner Tommy Calvert said in a prepared statement.